View of Colliston Castle from SW. Detail of re-entrant angle, Colliston Castle. View of SW elevation of Colliston Castle from NW. 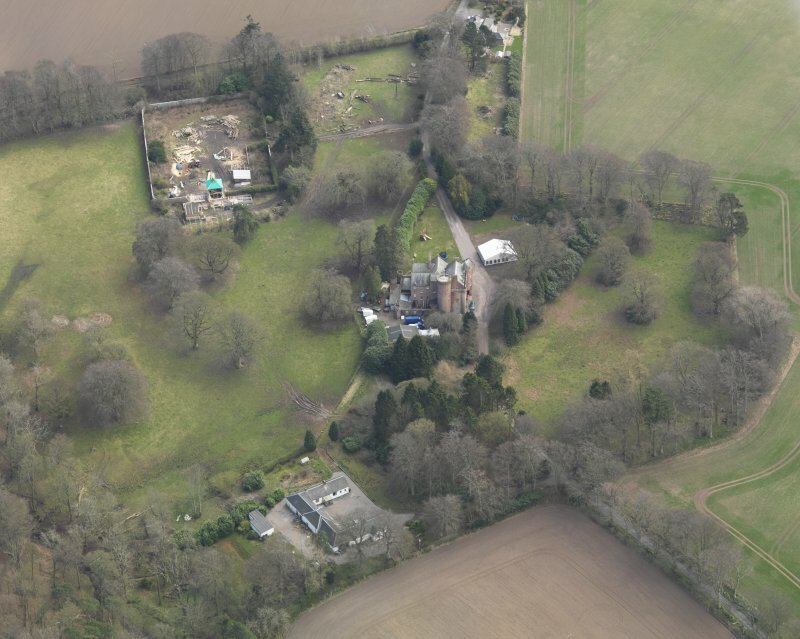 Oblique aerial view centred on the country house with the walled garden and stables adjacent, taken from the NW. 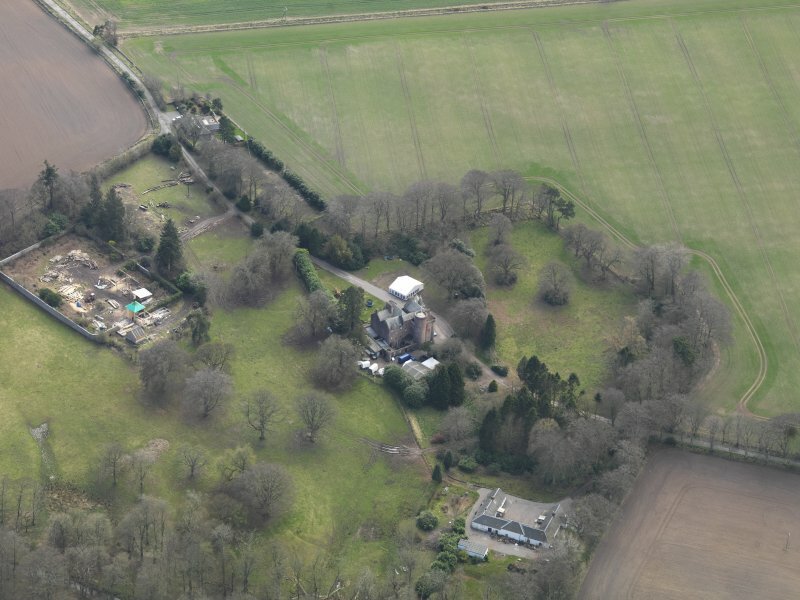 View of Colliston Castle from S.
Oblique aerial view centred on the country house with the walled garden and stables adjacent, taken from the SW. Detail of caphouse corbelling, Colliston Castle. 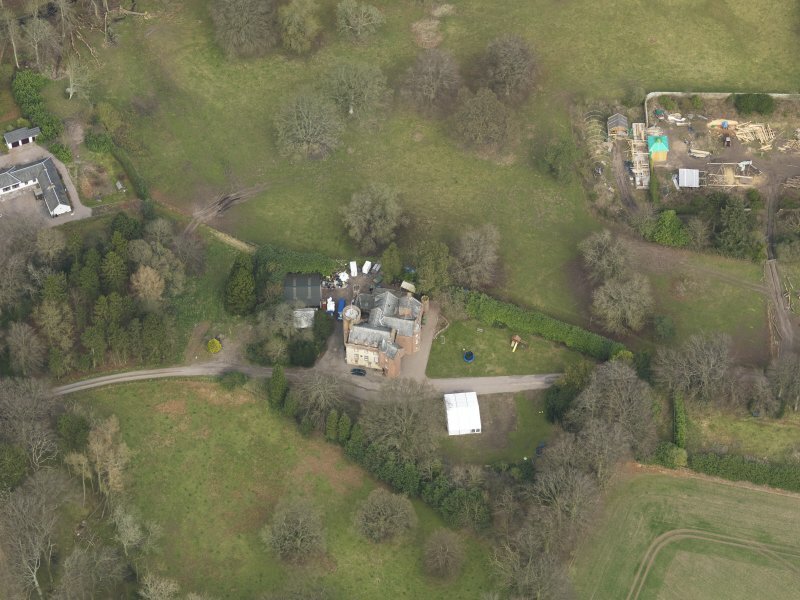 Oblique aerial view centred on the country house with the walled garden and stables adjacent, taken from the SSW. 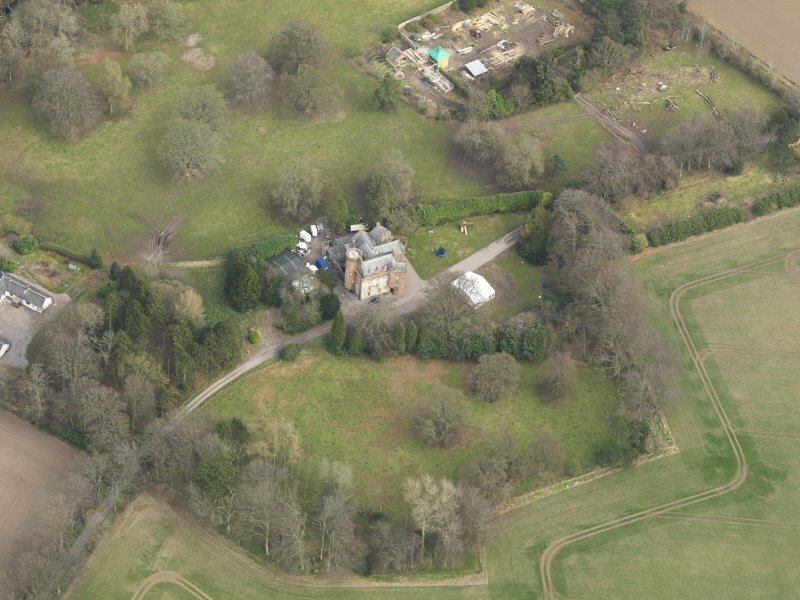 Oblique aerial view centred on the country house with the walled garden and stables adjacent, taken from the NNW. 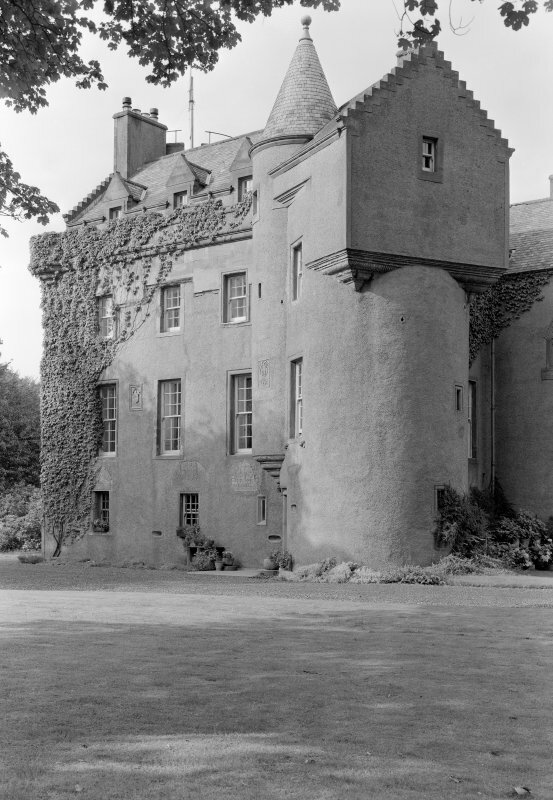 Colliston Castle is of the Z-plan, built in 1553 with round towers at the angles, both of which were originally brought out to the square at the top by means of corbelling, but only one retains this feature. The oblong block measures c. 45' x 24'6". 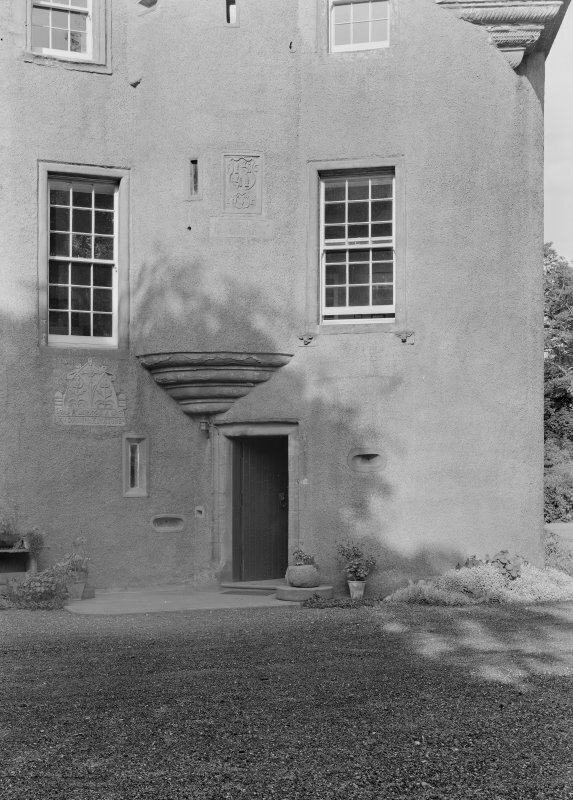 The entrance was in the re-entrant angle of the tower, and is flanked by two shot-holes, but in 1620-1 the entrance doorway was built up and a new entrance was made in the centre of the house. The first floor windows were enlarged, and the walls appear to be heightened, and a new roof put on. 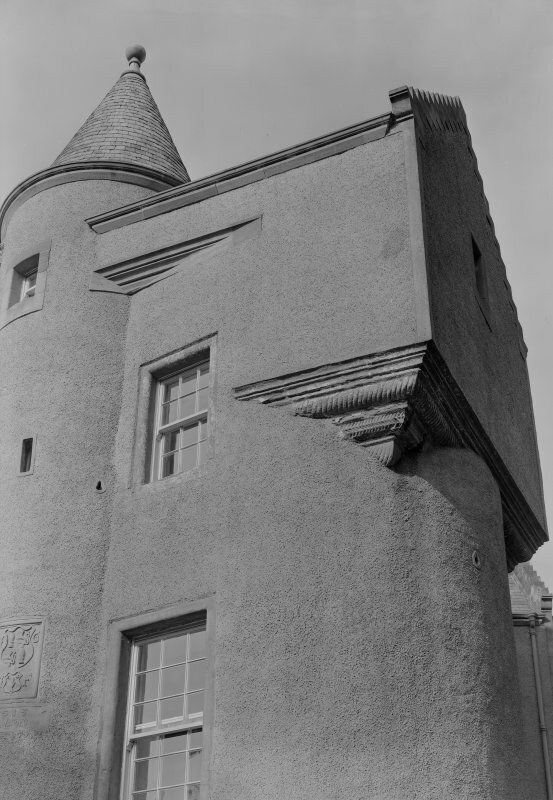 The date of the castle, 1553, is carved on the stair turret over the doorway. The new doorway bears the date 1621. The castle was occuped by the Guthries until 1670. 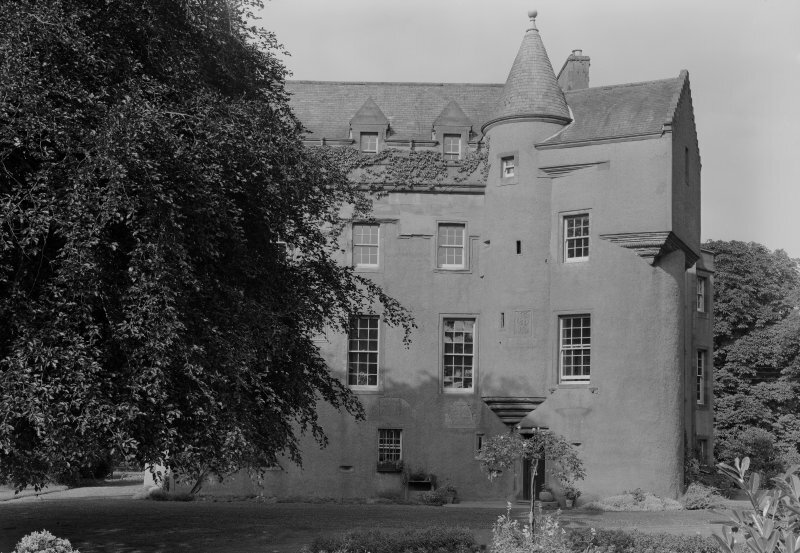 The SW portion of Colliston Castle is of Z-plan and is mainly as described except that the original entrance in the S re-entrant angle is again serving as the principal entrance, and the 1621 entrance is blocked up and a window inserted in its place. All the buildings to the N and E are modern, bearing dates of 1721, 1803, 1893 etc, while the date stones 1583 (not 1553 as stated) and 1621 remain where described. The altered NW tower is surmounted by a plain circular parapet, the walls are harled, and most of the window openings are modern. The building is occupied. 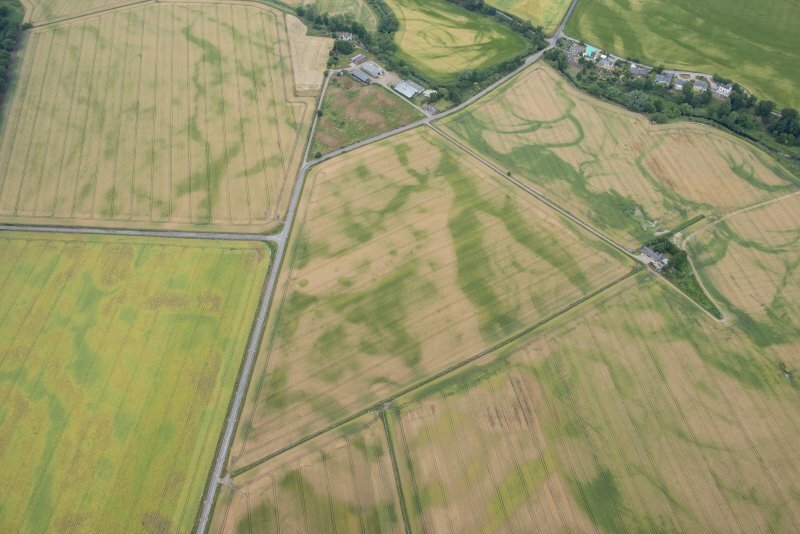 Architects: Hay Henderson & Tarbolton - alterations and resoration 1895. 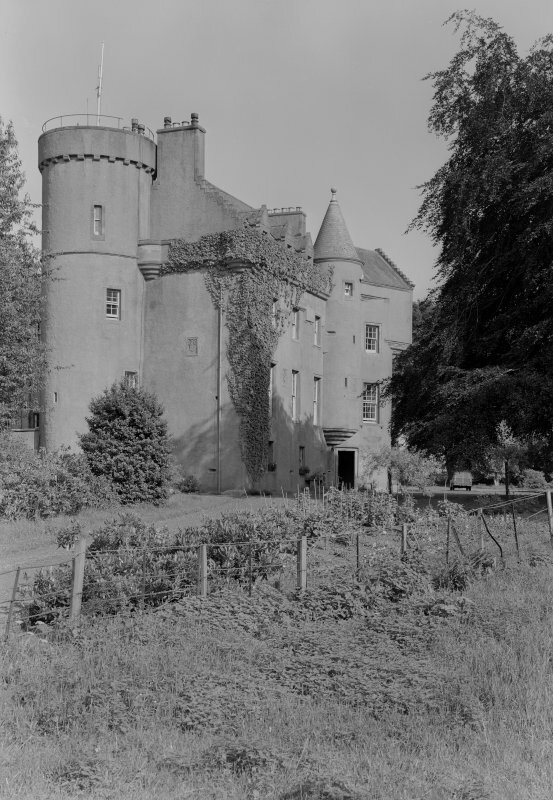 Photographs of the exterior of Colliston Castle, Angus, by the Ministry of Works/Scottish National Buildings Record in July 1957.